About Dr. Adam Madsen, D.O. "I grew up in the Basin area living in Roosevelt and Vernal. We are very excited to be back in my home town practicing orthopedic surgery in a great community. I love the Basin and all of the recreation and great people the area offers. My primary goal is to provide excellent orthopedic patient care to the people of this community." Dr. Madsen is married to Marci Bundy and they have 4 children. In 2000 he served a LDS mission in Porto Portugal. Dr. Madsen graduated Valedictorian from Uintah High School and excelled there not just in academics but also in athletics. He was named Academic All-State in football, baseball, and basketball. In baseball, he was Utah 3A State MVP, Region X MVP, All-State, USA TODAY-Honorable Mention All-American, and a won 3 state championships with the Utes. In football, he made All-State as quarterback, Region X MVP, National Football Foundation and College Hall of Fame Scholar-Athlete Award, and was USA TODAY - Honorable Mention All-American. Also, as a senior won the Mr. Uintah competition. After High School, He went Dixie State College in St. George, UT on a football scholarship to play football and baseball. At Dixie State he was named NJCAA Football Distinguished Academic All American, team captain, two-time Dixie Rotary Bowl Champion, three-time Western States Football League Conference Champion, and achieved 3 rd place National ranking. After getting his Associate of Science at Dixie, he transferred to University of Utah to play quarterback for the University of Utah under Urban Meyer. He was named Scholar-Athlete in Mountain West Athletic Conference in 2004 and was part of the undefeated #3 Nationally ranked Tostito's Fiesta Bowl Champions team. 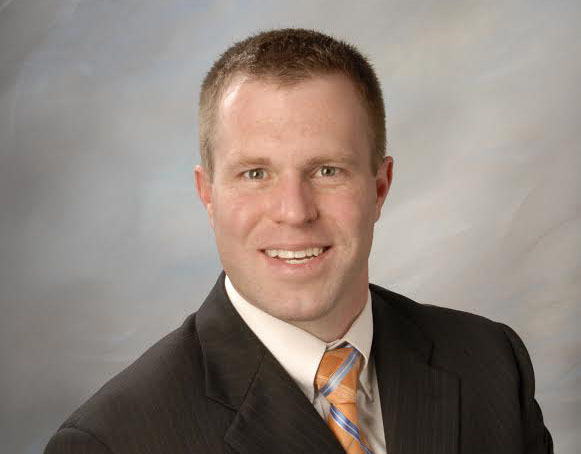 Dr. Madsen is a fellowship trained orthopedic surgeon with expertise in hip and knee replacement. He practices general orthopedics including diagnosing and treating operative and non-operative injuries. He also specializes in fractures, arthritis, partial knee replacement, sports medicine, ACL and ligament reconstruction, hip/knee/shoulder/wrist/ankle arthroscopic surgery, foot and ankle conditions, shoulder surgery, joint injections, hand conditions. Madsen A, Taylor B, Dimitris C, Hansen D, Steensen R, Gaines S. Safety of Bilateral Total Knee Arthroplasty in Morbidly Obese Patients. ORTHOPEDICS. 2014; 37: e252-e259. Sutphen SA, MacLaughlin LH, Madsen AA, Russell JH, McShane MA. Prevalence of Pseudotumor in Patients After Metal-On-Metal Hip Arthroplasty Evaluated with Metal Ion Analysis and MARS-MRI. J Arthroplasty. 2016 Jan;31(1):260-3. Watson BC, Madsen AA, Persinger FD, Taylor BC. Obtaining Volar Tilt in Distal Radius Fixation: Use of a Screw as a Proximal Post. Accepted to Journal of Surgical Orthopedic Advances. Madsen A, Serna F, Mehta S. Difficulty of Total Hip Arthroplasty Following Open Reduction and Internal Fixation of Acetabular Fractures. Submitted to Injury. Madsen AA, Ziemba-Davis M, Azzam KA, Meneghini RM. Patient Functional Activity Level and the Performing Surgeon Affect Patient Satisfaction After Modern Total Knee Arthroplasty. In-progress abstract submitted. Madsen A, Regan D. The Association of Palmaris Longus Tendon in Dupuytren's Contracture and its Prevalence.